I am pretty sure I have owned almost every baby wearing device (Baby wearing is strapping your baby into a carrier on your body rather than carrying them in your arms. It leaves your hands free while still keeping your baby close and secure.) out there from an old-fashioned Snugli, to a trendy Baby Bjorn, to a homemade sling. I’ve tried them all and had minimal luck getting any of them to either fit right OR for my babies to actually like them enough to stay in them more than 5 minutes. I think that someone who baby wears successfully needs to offer a class to teach those of us who just can’t seem to get it right to do it correctly! FINALLY, with Isaac (my youngest), I have found a few that have worked well. However, as soon as I find something that works, his development changes and he decides he wants something different. Then I’m on the hunt again! There are so many out there that it’s overwhelming and confusing, so I decided I am going to try to review the ones I have used and give my honest opinions based on fit, ease of use and, the most important aspect, how much my baby liked it! When Jonathan (my oldest boy) was born, I didn’t know much about baby wearing. I figured you just carried your baby around for the most part. I had a lot of friends who had crotch danglers (more on this term later) – so this was my “norm”. I did have one friend who had a sling, but she didn’t live close by, so I didn’t pay much attention to it. Then I had a colicky baby and was willing to try ANYTHING to help him sleep more. I had a Snugli I had been given, so I started there. It was free, so why not? The Snugli that I had they don’t even sell anymore. It wasn’t comfortable and it was next to impossible to get Jonathan in it without being a contortionist. I gave up on that one within about 5 minutes of finally getting him into it (with help from my husband – who worked full-time. So, clearly that wasn’t an everyday option). I went to Target and perused their selection and ended up with an Infantino Baby Rider. The reviews on the box were glowing (yes, yes, yes – I know the testimonials on the box are clearly the best ones they have ever received. I was desperate and cheap! ). This HAD to be better, right? Well, it was BETTER than the Snugli. I could get him into it on my own without much discomfort, but he didn’t feel at all secure in it. He must have felt the same way because he cried the entire time I had him in it. Strike TWO! My final attempt with Jonathan came in the form of an $80 Baby Bjorn that many of my friends had and swore by. It had better back support, so it was supposed to be more comfortable for the wearer. It may have been more comfortable for me and he did feel more secure in it, but, again, he cried the entire time he was in it. If he was going to cry anyway, I figured I may as well keep it and get some work done while he cried. But, it was pretty clear he was miserable. So, after about a week of having a baby scream into my chest while I attempted to rock him and pull dishes out of the dishwasher or vacuum, this too was retired. Eventually, the colic stopped and Jonathan just became a hip attachment, so no other carriers were purchased and life went on. I knew that with my future babies, I really did want to try to wear my babies. By then, I had researched enough to know that babies who are worn tend to be happier babies and cry less. I NEEDED to make this work so that we didn’t have to live through 6 weeks of colic again. The carriers I had used with Jonathan are considered “crotch danglers”. What that means is that the baby hangs from you by their crotch instead of a natural seated position. It is not comfortable for baby and it’s not good for their hips at all. Obviously anything used in moderation isn’t likely to be a problem, however, since it is advocated to wear your baby as much as possible in those first few months, moderation may not be practiced and these types of carriers have been associated with hip dysplasia in small babies. For these reasons and because they were supposed to be more comfortable, before Micah was born, I had decided to purchase a ring sling. I practiced with baby dolls and flailing kitties to be sure I could get him into it on my own. Then came the real baby. To be fair, this was a sling I ordered on the internet that a stay at home mom home business made. It wasn’t a name brand Maya Wrap, Over The Shoulder Baby Holder (a friend had one of these – they are padded) or even a generic Nojo (which I have since tried – I am way too short for padded slings. You can’t pull them tight enough and I even have some extra fluff in my mid region. I don’t recommend them if you are under 5’4”.). The first time I put Micah in it, we were strolling around the yard. The ring kept slipping and slipping and slipping. I kept tightening and tightening and tightening. Finally, once it slipped so far that had I not also been holding him due to said slippage, he would have fallen out onto the ground. It scared me enough that I never touched that sling again. I am assuming it was made of the wrong type of fabric. So, the moral to this story is if you buy a sling that isn’t mass marketed, make sure you know what it’s made of and talk to people who have used this product before you to make sure you aren’t paying for something you can’t use, or, even worse, may be dangerous to use. After this failed attempt, I had another friend who offered to make me a Mei Tai style carrier. These are akin to what you see in Asian movies where the mothers take their babies and essentially tie them to themselves (usually on their backs) so that they can work in the fields and keep their babies with them. I had MUCH more success with this carrier, but I didn’t get it until Micah was about 6 months old. We were fortunate that Micah did not have colic. He was a generally happy, easy-going baby. So, I didn’t feel the need to get another carrier right away with him. The Mei Tai is great for older babies because they are comfortable in it, it has lower back support so it is comfortable for mom and it can be worn on your front or on your back. They can be a little complicated in this traditional form (newer Mei Tai style carriers like the Ergo are a little easier to put on), but it wasn’t too bad and I liked that I could adjust the straps for my height because there was no padding or buckles to stop me from being able to pull it tight. Overall, I liked it a lot for him in the stage he was in, but I didn’t see it as being a viable option for a tiny newborn. So, with my next baby, I started the hunt again. When I found out I was pregnant with Elijah, my third, I was pretty disheartened with the whole baby wearing thing. I couldn’t figure out why everything I tried either made my baby or me miserable. Why did people rave about happy babies and how comfortable this or that carrier was and I couldn’t find a single carrier that I liked for a newborn (the stage when baby wearing is the most important and most HELPFUL for mommy!)? I got on the internet and started researching like crazy before Elijah was born to see if maybe I was missing something. This was in 2007 and “crotch danglers” were still what was sold. I decided to give an updated version of the Baby Bjorn a try. They were supposed to be more ergonomically designed and I found a good price on one. I had the Mei Tai to use later, so I reasoned that it would be short-term use and wouldn’t hurt him. I didn’t have high expectations anyway because nothing else had worked well in the past. I am still not sure why I spent the money because, once again, he hated it. Admittedly, this one was easier to get the baby in and out of, but it still hurt my back after 5-10 minutes and my baby screamed in it. After this, I honestly gave up. I was done spending time and money worrying about this, so Elijah stayed in my arms. It meant I didn’t get as much done as I should have, but he was happy and that’s what matters. The Fourth Time’s the Charm! With my 4th and final baby, I started asking friends who had success with baby wearing what they used so that maybe I could be successful this time! 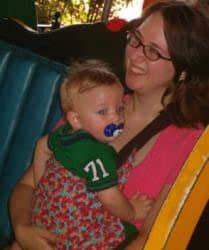 I had three other kids to take care of, so baby wearing was not just something that sounded like it would be beneficial to my baby, but was also a necessity if I wanted to care for all four children! The Nojo is a padded ring sling. That’s great for long-term wear IF it fits you right. All that it meant for me was that I couldn’t tighten it enough, so the baby sat way too low. This sling has a little too much “structure” for me anyway. I like something that moves with the baby and this one has very specific padding, so you have to keep the baby in certain positions so that the padding won’t come in contact with his/her face. To me, that’s not really safe, so I probably wouldn’t have used it much even if it had fit right. The Seven Sling is just a ring of fabric. I washed it and dried it in hot water to try to get it tight enough and it sort of worked a few times, but then it would stretch out again. Again, my torso just isn’t long enough! I did use this one the most and, ironically, you can usually get these for under $25. If you want to get one of these, I suggest that if you are less than 5’3”, you go down a size from what the website suggests and you should be okay. For the price, I still think they are a good option and you don’t have much to lose! The Ergo Baby Carrier isn’t great for a newborn without the newborn insert, so I put this one away for later use. I did use it later as he got bigger and, again, I am just too short. The straps are padded, so you can’t tighten it beyond a certain point. My baby sits slightly low and I end up with a sore back. However, I will say that of all of the structured carriers I have tried, this one is, by far, my favorite. It is very comfortable for my little guy and he stays very happy in it. They are pricey, but this one I would highly recommend. It had a little carrying pocket good for keys and either a credit card or cash and has a fold out head support to keep out noise and other stimulation while your baby is sleeping. Of the pricier carriers I have tried, if it fits you right, this one is worth the money you will spend on it. I still use it even though it hurts my back after a while (I just don’t wear it too long) because Isaac is so happy in it and it doesn’t get ridiculously hot. I REALLY wanted to like this carrier! It’s not structured at all and is very versatile. It has gotten rave reviews for use with newborns and you can tie it as loose or tight as you need to, so my vertical challenges wouldn’t be an issue with this one! There’s one thing I didn’t factor in. This carrier is essentially a LONG piece of fabric that you tie and then wrap and wrap and wrap some more to get the desired fit. We live in South Georgia where we don’t really have a winter (at least we didn’t this year). All of that fabric coupled with 60+ degree temps equaled one hot mama (and not in a good sense!!!) and a sweaty, uncomfortable baby! I used it a half a dozen times and ended up selling it for half of what I paid for it. Thank goodness for the free carriers or I’d really be broke from this journey!!! My recommendation would be that if you have ANY sewing skills at all, find the measurements (Here, I’ll help! LENGTH: 5 meters (~5 yards, 18 inches) WIDTH: 23″ MATERIAL: Cotton jersey) and just make your own rather than spend $45-$50 on a new one. (Ironically, I ended up trying my Mei Tai – made by a friend – again with my newborn and was able to make it work pretty well! So, that ended up being my newborn carrier after all! I wish I’d tried it with my third baby, but I assumed it wouldn’t work well for a newborn). The Baby K’tan is more like a pouch because it is sized and can’t be adjusted (a problem for me!). A good friend loaned this to me to try. It said a medium should fit a size 10-12 – exactly the size I currently am. BUT, to be fair, it does say in the instructions and on the website that if you are less than 5’2”, to go down a size. I am 5’2.5”, so borderline. Clearly, I should have gone down a size because it wasn’t nearly tight enough. I tried putting it in the dryer as she suggested to tighten it up, but that didn’t help. I even tried (Lisa don’t kill me!) soaking it in really hot water and then throwing it in the dryer to try to shrink it up a little – no luck. Still too loose. So, while I like the concept of it and think maybe it could have worked had it fit right (and I think it would be a GREAT alternative to the Moby in a hot climate because the “Breeze” model has mesh type panels to let it breathe and holds the baby similarly). If I could try a small, I suspect I would like it. But, just beware to make certain you get the right size! Measurements might be helpful and the website doesn’t have measurements – just size comparisons. They do have a liberal exchange policy if it doesn’t fit correctly (I wonder if they’d let me exchange my friend’s?!?! LOL). My friend who loaned this to me is considerably taller than me and she loved it so much that she ordered a second after leaving hers behind on a trip. So, clearly it’s a good option! I just didn’t have one that fit and was too cheap to spend the money to try again on a smaller size. I’ll admit I had to have a tutorial from my friend who gifted this to me on how to correctly use it! Slings can be tricky to learn how to position and tighten properly. However, once you get it, you get it. A HUGE benefit, in my opinion, to a sling over other carriers is that they are quite quick and easy to get the baby in and out of. I also think they are the most comfortable for baby because they conform to the baby and basically just support them (replacing your arms) so that your hands are free. As with anything, you have to be cautious and not just assume your baby is safe in there because there have been reports of babies suffocating in them (I see that as being a lot more likely in a padded one for reasons I previously mentioned), but most “baby wearers” tend to practice attachment parenting and are very attentive to their little ones. So they would likely notice if something was wrong with the baby’s position and would adjust. 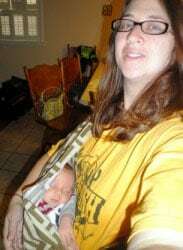 Now that I have finally figured out how to use it (and practice a lot), the Maya Wrap Ring Sling has become my new favorite baby carrier and I can see why they’ve been successfully selling slings for a long time now (15 years and going strong!). My youngest (my sweet Isaac) is now just over 8 months old and I am using the sling in a hip carry for him. He is old enough that he wants to be able to look around, but it’s nice to have the use of my hands when I need them and he’s attached to my hip! And, best of all, I can make it as tight as I need to in order to make sure he is secure and can’t wiggle his way out (he’s an expert wiggler!). Research Baby Carriers Before You Buy! I am lucky to have friends who loaned me many of my carriers, so I didn’t spend a lot of money to test out the ones I tried, but I still spent probably close to $200 on baby carriers that didn’t work for me. I would recommend really spending a lot of time searching the internet for reviews of different carriers. Look for what people recommend for your build, your height, your weight and read testimonials to make sure you are getting the right baby carrier for you. What I like may not be what is comfortable for you, but reviews like mine would have been helpful to me when I was looking. And, also keep in mind that the carriers I reviewed are far from the only ones out there. I’ve also heard wonderful things about Beco baby carriers, Rockin Slings and Bamberoo Mei Tais, among others! Just be careful – much like cloth diapering (again, another blog, for another day! 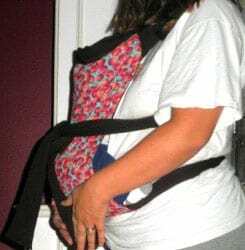 ), baby carriers can become addicting and expensive!!! Do your research first and your wallet will thank you! Nice reviews Amy. We’ve had a lot of success with babywearing and use different types for different stages and situations. We have a Pikkolo – a safer way for a 4-12 month old baby to be front facing, but also a great soft structured carrier (SSC). A Beco Butterfly 2 – super easy SSC for back carries. A Moby – good for tiny newborn phase. And finally, we both love Pouch Slings which are well fitted to each of us and we keep in our diaper bags for unexpected quick carries. Anyway, as you said, it’s best to do a lot of research before investing in a carrier. Ideally even try a few on. Homemade may be okay for more experienced wearers who know what to look for, but definitely do research first to make sure what your selection is safe! In my area there are BabyWearing groups that meet and have a library of carriers to try. It’s a great way to learn a lot and meet other moms! There are so many baby carrier options out on the market today, it really takes a parent a lot of time and hassle and possibly money to even figure out what the best deal for a baby carrier is. I can relate to the author’s struggles for sure, only I at least have this article to help me out. For one, I had no idea that crotch danglers could be so detrimental to babies; hip dysplasia definitely sounds like something no parent wants a part in. For two, I had no idea that finding the right baby carrier could be such an ordeal for a shorter person! (Or at all, really!) It sounds like the author here really tried the gamut of possible carriers and the reviews were very, very helpful. My mind definitely is changed about the kind of baby carrier I buy in the future; namely, I will not be getting crotch danglers for shower gifts anymore. I appreciated that the author also seemed to try everything from the internet-purchase to the homemade sling to the trendy new brands and was able to give an honest review of each baby carrier. Her honest reviews will save me and others a lot of time and money when shopping for a baby carrier! First of all, I have to say that I absolutely love your picture there. I am also a happy mom and there truly is nothing as fulfilling as being a mom. As soon as my son was born, it’s like I knew that was a huge part of what I was created for and all the silly stuff I cared about just didn’t matter. That look on your face in that picture says it all. You look like a very happy mother. I’m sure your son loves you very much. I remember when I was shopping for baby carriers, I had no idea which direction to go in. The first thing I got was that long piece of fabric that wrapped around your entire body, but I couldn’t make that work. I think that some of us have to know someone with experience to make that one work for us. I eventually ended up with the little black one with turquoise on the inside for a huge part of his infanthood. Then after he outgrew that one, I used the Infantino for awhile, but he outgrew that very quickly and now he’s done with them altogether. 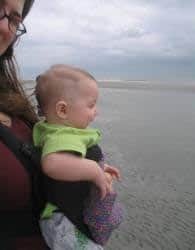 I recently had my first child about six months ago and when I decided we were both strong enough to venture out into the world once again, I knew I wanted a forward-front style baby carrier to get my little guy around in. The benefits are obvious for bonding with your child and making sure that it is secure, but I wanted to make sure that the device would be a good fit for both of us and make us both comfortable. One thing I was worried about was balance. Adjusting to the extra weight of carrying my baby (on the outside at least) and the way it would be positioned on my body, I knew that there would be some instances that I would have to be very careful not to lose my center of gravity and endanger us both. For this reason, I went with a carrier that is placed higher on my torso so I am more aware of the shifts in our balance. So far, I think it is working out beautifully, but I assume as my boy gets bigger, I will have to adjust. Every new mom should get a baby carrier. It’s one of the sweetest things that you can do for your baby. When my son was really little I could wash dishes (in cool water of course) around him. The thing is, when they’re really little, they need to be close to your body. They need to be held, so the carriers are really good for that because you can do some straightening up and carry them at the same time. I had the Snugli first and for $19.95 it was a really good bargain. It lasted for a long time and he was perfectly comfortable inside. I eventually had to get an Infantino because he got too big for the Snugli. Though he would probably love to be in the carrier again, he’s a bit too old, so I usually carry him around sometimes, but mostly let him walk. They will always need a hug sometimes though. It helps them to feel loved and safe. It’s really important to help your kids feel loved and safe with hugs and actually playing with him or her. Hugs + Chase + Banging blocks together = Big Fun! Thank you so much for sharing your experience with all these different baby carriers. I think as a mother I would like to be able to try them all and find out which one is best for me and my child but I just do not have the time or the money to try them all realistically. So when I found your product by product review, I was very excited to see what you thought. I was always nervous about the “crotch carrier” baby carriers because I did not think that would be good for the baby and now I feel like my fear was somewhat justified. Just the way the hips would get spread out like that did not seem quite right. I will likely try a couple of the other ones you reviewed and see which one is best for my child and myself. I think it will take a little trial and error but we will eventually find the right one. It is really important to me to do this as I know how much that means towards the bonding of mother and child. I think the Baby K’Tan looks like a very comfy baby carrier. Since I am 5’5″, I don’t think I would have much of a problem with the height issue. I think I am more worried about neck and back support for the baby than anything. I mean, some of those carriers look very comfortable and I am sure they do support the neck and back just fine or those places would have been sued about a million times by now, but my own paranoia makes me worry about things like that. Then again, if you don’t have a carrier, you are still going to have to carry the baby everywhere you go, but you are never going to have two hands free. I am not a very graceful person, but with my last child I was pretty impressed with my ability to multi-task with a baby in my arms. I mean, this is coming from a woman who can trip over her own two feet and can’t catch a ball to save her life. Some days I can’t believe my child actually survived me being the one to carry him around! A sling sure would have made things a lot easier! I think when my son was an infant I may have had one baby carrier. I was not very fond of it. It did not seem comfortable to me and I always worried that my son was going to fall out while I was wearing it. But I have to say they look really comfortable and I know several moms that use various styles of them. They just did not appeal to me. I happen to have a mild case of scoliosis. I never had to wear a back brace or anything, but I do sometimes have back pains doing normal things. For instance, I love to swim but I can’t dive. If I dive correctly, I end up in agonizing pain. If I have to dive incorrectly, then I may as well not do it at all. I think mothers need to research the impact the carrier could have on them as well as the baby before they get a carrier. If you do not have any kind of back problems, there should be no issues, but if you do, you could end up making it worse. I think you should also make sure you are wearing the baby carrier properly. It kind of reminds me of wearing backpacks. If you don’t wear them the way they were meant to be worn, you could cause some serious damage over the course of time. I had no idea there were so many different types of baby carriers out there. I also had no idea that you could make them yourself. I’m sure this is an item that many women request when having a baby shower, but I’m also sure that many first-time mothers have no idea what to ask for. This is a wonderful article because it gives first-time mothers such a detailed guide on what works and what doesn’t. This can also help mothers save a lot of money and avoid bad purchases. Personally, I can see how a baby carrier would be extremely useful. Having your baby with you at all times while you do light cleaning, shopping, and other daily tasks would make a mother’s life so much easier. There’s no fumbling trying to get their carrier in the grocery cart or pushing a stroller while trying to walk the dog. It just makes sense to have a baby carrier that you wear. As someone with a bad back, I would certainly need something that offered great support. I had never considered how some carriers might be more straining than others. I like the look of the slings, but also worry about how safe a baby would be in them. I have this horrible fear my baby would slip out.